When it comes to cyclocross racing in America, Cannondale has been a stalwart entry at the race with more than a few national championship wins to its credit. 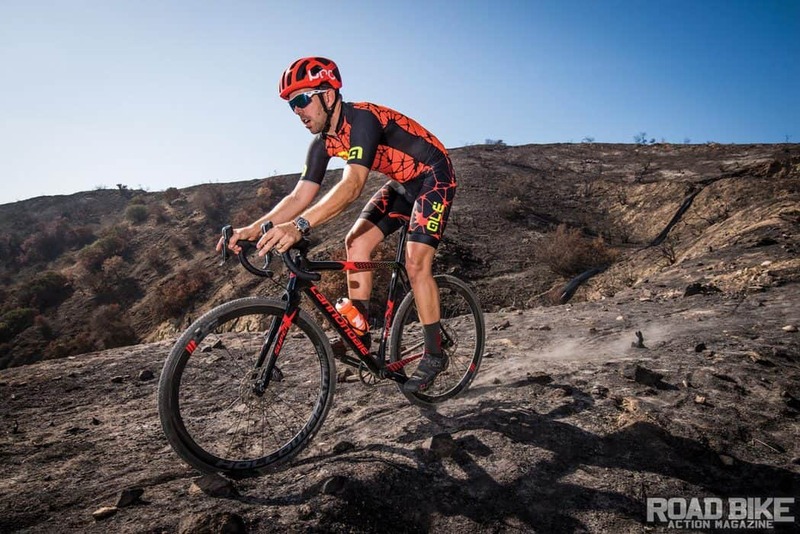 The SuperX represents the brand’s carbon fiber family of ’cross bikes with a three-model line of less expensive aluminum geared towards the entry-level ’cross fanatic. In addition to the frame’s use of Ballistic carbon, the SuperX also touts Cannondale’s proprietary SAVE frame design to provide added compliance. The most visible of the SAVE attributes are the shapely chainstays and seat stays and undersized 25.4mm seatpost. Taking proprietary frame design a step further, the SuperX also employs the brand’s own Asymmetric Integration, which is Cannondale’s fancy term for an offset drivetrain to allow for wheel clearance for up to a 40mm tire. Not that anyone would need to revert back to mechanical shifting with a 2x chainring, but there are spare frame ports to aid the retro conversion. With the growing popularity of 1x drivetrains, Cannondale’s long-ago decision to develop their own line of cranksets now proves downright prophetic. The SuperX uses a machined 40t Hollowgram Si crank matched to an 11-32 rear spread in back. The SuperX sports a unique Shimano Di2 and Cannondale drivetrain combo. Given Shimano’s still-delayed entry into the world of 1x drivetrains but still desirous of the gift of electronic shifting, Cannondale was forced to spec a rear derailleur from Shimano’s mountain bike catalog. As such, the SuperX stands apart from many production 1x bikes with its Shimano XT Di2 rear derailleur to move the chain. Bound by 12mm thru-axles, Cannondale’s in-house Hollowgram carbon clincher wheels mounted with 33mm Schwalbe X-One tires keep things rolling with Shimano flat-mount, hydraulic disc brakes with 160mm rotors taking care of stopping duties. Early in 2017 we rode our first SuperX, which we raced and rode with nary a hint of a downside. The 103cm wheelbase and SAVE frame shapes made for a stable and compliant ride. Our new bike exhibited most of the same positive ride qualities, except for a fair amount of “fork flutter” when braking hard over sustained sections of washboard bumps. Since our first bike ran with 140mm rotors, we could only attribute the flutter to the effects of the increased braking force of the 160mm rotor on the small profile fork. The nifty Di2 gear indicator is a nice touch. As the SuperX was intended to be used, the Cannondale excels at ’cross. The front-end geometry is relaxed enough to make for stable handling, yet still sharp enough to get the front wheel turned when it’s needed. The SAVE technology frame provides noticeable compliance. Unfortunately, the one thing that prevents the SuperX from being a solid gravel bike is its lightweight fork that flutters under hard braking. If the national championship title that the SuperX won last year is any indication, the SuperX definitely excels within the arena it was designed to perform in—at the racecourse. And while we do like cyclocross, it’s the wider-use potential that gravel bikes bring to the table that intrigues us more. As much as the SAVE design really works to dampen the rough ride, due to the tall gearing, 33mm tires and front fork flutter, the SuperX hits the limits much sooner as a capable dual-purpose bike. As luck would have it, the next bike down in the four-member SuperX family is the Force 1 SE model, which runs a much more gravel-friendly spec with an 11-42 cog and 37mm tires, all for $1000 less.